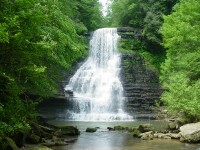 Try your hand at fly-fishing or reel in a trophy bass from a Tennessee lake.� We have pristine rivers flowing from the mountains and a series of beautiful TVA lakes with boating rentals available.� Learn to tie flies or cast and then catch and release or eat the freshest trout rolled in cornmeal or grilled in the woods at one of our many parks. A fishing license is a good investment in Tennessee and our innkeepers know the ins and outs of the local fishing agenda.� Below are Tennessee B&B's that have fishing locations nearby. Evins Mill features a forty acre property that includes Evins Mill Pond, where guests may fish for bass and brim. Nearby is Center Hill Lake, one of Tennessee's most popular recreational lakes, and the Caney Fork River - both great for guided fishing tours. Fly fishing in the Great Smoky Mountains, Gatlinburg fly fishing guides will take you to Cosby Creek or Big Creek, or wherever the fish are biting. Our creek at Whisperwood is stocked right at our bridge with trout, so you can walk over and catch your breakfast! I'll cook if you catch! Or ask for fresh trout for a dinner entree and we will catch! Lots of open meadows to practice and a big wetlands...try hitting a hoola hoop in the pond to check your aim. Some of most beautiful scenery in America right in our own Smoky Mountain National Park with wild trout up in the back country. Enjoy comfortable nights at our inn, feather bed toppers and delicious breakfasts and dinners. Third night half price to fisherman but you must catch something and give us a photo! We are the closest B&B to the Great Smoky Mountain National Park where rivers criss-cross the landscape everywhere you drive. Local guides can be arranged for the day before you arrive, for a reasonable rate, or you can go it alone, starting in the Little River in Townsend, just 3.2 miles down the road. There is no better place for fishing than Northeast Tennessee.... from the streams (some stocked and some gloriously natural) to the tail waters of the Watauga Lake Dam (highest earthen dam east of the Mississippi)... you are in fishing paradise. LITTLE KNOWN SECRET: the fishing guides from both Abingdon, VA, and Foscoe and Boone, NC, each brings their paying guests to OUR area for fishing. 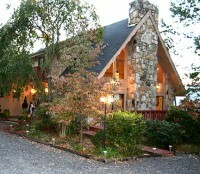 For lodging, choose or inn OR our Cottage in the Woods, which sleeps up to seven (5 beds + sofa).